Printing to the Sky (2006), cardboard boxes, glue, staples, flagpole armature. 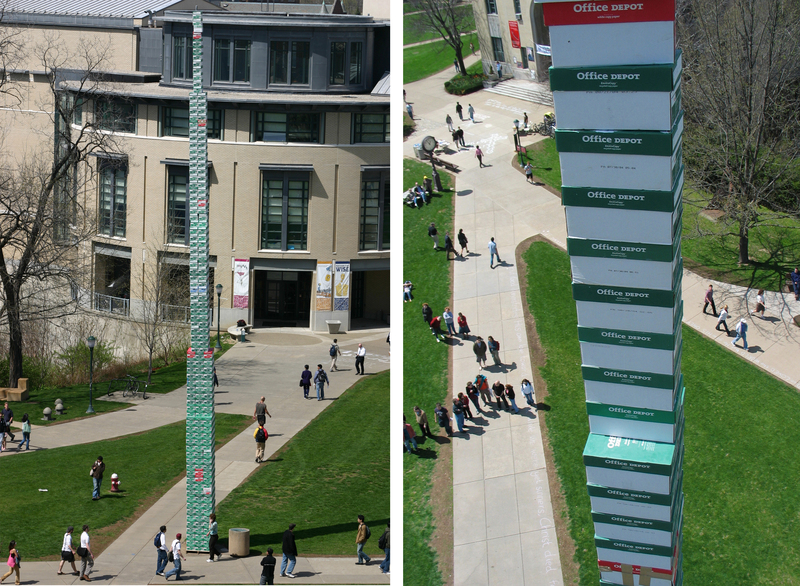 65 feet x 54” x 36.” Temporary public sculpture, campus of Carnegie Mellon University. If our artistic counterparts, centuries ago, were limited by a narrow range of conventional materials with which to work – clay, marble, bronze, wood, plaster – today’s sculptors are faced with a different dilemma: a virtually infinite list of materials and methods. Moreover, the cultural sophistication of a contemporary audience demands a direct correlation between the materials an artist chooses and his intention, or concept. I learn “on the job” how to work with unfamiliar materials, developing new skills to meet the demands of each interesting project. There was no precedent in my career, for example, to guide me in the construction of Printing to the Sky (2006), a 65-foot tall tower of cardboard boxes. With the advice of a civil engineer, who calculated the potential wind load of such a structure, and the expertise of an extremely patient cherry-picker operator, I was able to realize my artistic vision. Rarely does a contemporary artist work in isolation, particularly when his ideas are ambitious. It is this sort of ambition and openness to collaboration that characterizes my practice. « Bill Cravis @ STUDIO Visits! You are currently reading In his words… at STUDIO VISITS.